Dogecoin, the virtual currency which started as a bit of fun but has gathered some steam, is the most transacted cryptocurrency on the Web. Data from Bitinfocharts.com — spotted by Hacker News users — shows that the number of Dogecoin transactions over the past 24 hours came in at 102,252, that’s some way ahead of more established currencies like Bitcoin (56,169) and Litecoin (9,329). 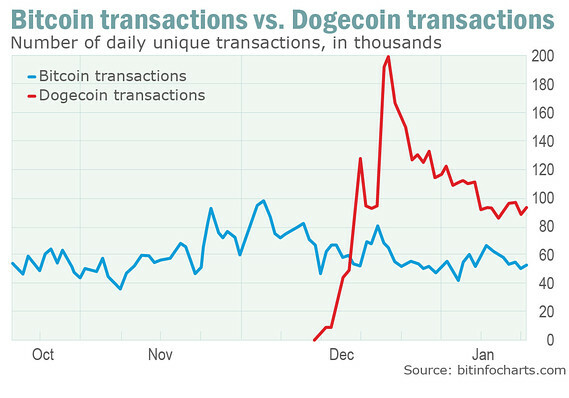 This chart from Marketwatch shows how the volume of Dogecoin transactions overtook that of Bitcoin in December 2013. Yet, despite the large volume in transactions, Dogecoin is unlikely to become the top dog in the virtual currency world. There are numerous differences between these three (and indeed other) virtual currencies out there. Bitcoin and others are often hoarded and saved due to their high value, but Dogecoin was developed specifically for transactions. Unlike credit cards and other payments methods, there are no transaction fees and the denomination goes low enough that you could pay $0.001 for a service, for example, without incurring significant costs atop of that. The point of any currency is to exchange it for goods and services so making a pile and hiding it in a secret lair is no good to anyone. We hope that through this foundation we can encourage the growth and use of dogecoin as the premier currency of the internet, rather than it existing as a fiat equivalent commodity. Secondly — and as a result of its primary aim — Dogecoins holds a significantly lower valuation than other coins. Indeed, those 102,252 transactions came to the value of just under $13.5 million. That’s impressive but nothing compared to the $23 million of Bitcoin that is transacted per hour (on average), or Litecoin’s hourly average of over $6 million. That’s not to detract from Dogecoin, it is certainly impressive to see the virtual currency gain a significant amount of adoption, but it isn’t about to dethrone Bitcoin as the top virtual currency. Nonetheless, you should keep your eyes on the development of this mutt.